Great art can sometimes be powerful enough to break taboos. 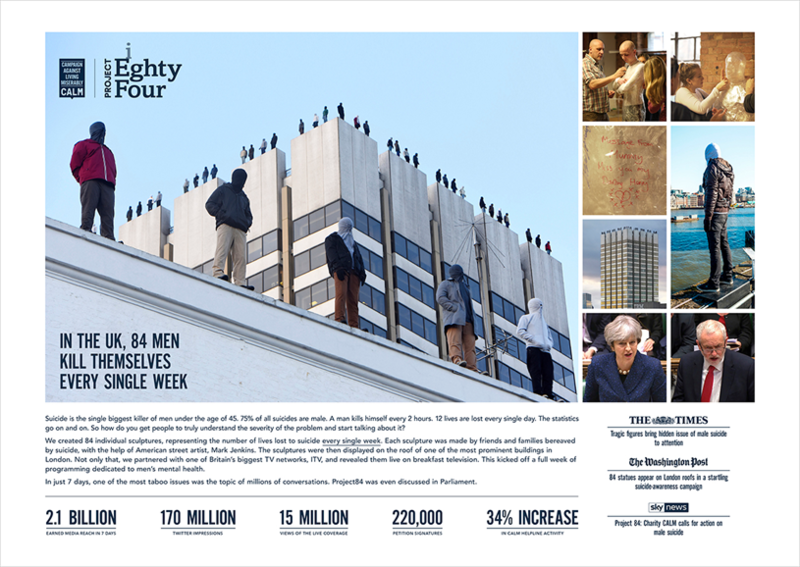 When UK creative agency adam&eveDDB and charity Calm collaborated with American street artist Mark Jenkins to create 84 life-size sculptures of male suicide victims, the resulting campaign knocked the ball out of the park. Horrifically, every week 84 men in the UK kill themselves – that’s a life lost every two hours. With 75% of suicides committed by men, a hard-hitting creative campaign was needed to get people talking. Project 84 did just that. The super-realistic sculptures were lined up in a row on top of the ITV studios on Southbank, London, as if about to jump to their deaths. The campaign smashed expectations. It generated 170 million Twitter impressions, 15 million views of live TV coverage, 220,000 signatures on a petition and a 34% boost to Calm helpline call volumes. Make your next campaign as powerful as this one by partnering with UK creatives. London's the best city on Earth, innit? Why a wristband helps kids when arthritis is Ouchie!